whitebrickwall: the X-files...woo oo oo oo ee oooo. 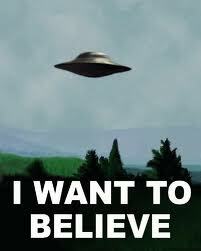 the X-files...woo oo oo oo ee oooo. The X-files television program started around 1993/1994. We were living in Pottsville at the time and my parents loved the show. Being only 10-ish years old, my bed-time was right when it started... and boy did that theme music freak me out. Just before the series began, I had somehow seen the start of a movie where aliens abduct a young girl from her home. I never watched the whole movie, just the beginning, and it was terrifying. I remember being freaked out by what I saw for many years to come. The X-files theme tune reminded me of this movie, and needless to say - I was in bed smack on time those Wednesday nights. I remember racing from the lounge room, upstairs to my bedroom trying to get there before the song started. Well 17 years on and Adam and I just started watching it from the very beginning and we are LOVING it. And... like a real grown up, I am proud to say - the theme song doesn't even scare me any more. You can see Adam and Leo in this photo from the banana cake blog. They are snuggled up together with our beautiful quilt made by Penny. 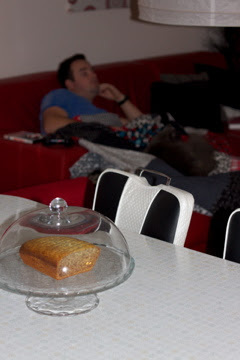 We were watching the X-files as a family while I finished baking (and eating) my banana cake. Look at Leo (so handsome! 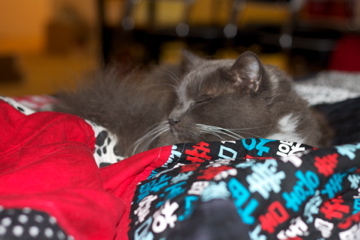 ), purring like a mad man, because he is spending quality time with his mum and dad. I love him so much. Right this moment he is sprawled out on the floor in front of me, looking like an idiot. I want to be a mum soooo bad, and I have so much love to give that this poor cat has to cop everything. I love it now. And well...that song called Yellow? It was just depressing and ridiculous with an annoying and boring film clip. Coldplay are my most favourite band. We are loving the X-files so much that we are seriously contemplating putting Mulder's classic poster somewhere on our whitebrickwall. Anyone else watching shows or listening to music they once weren't fans of? Better go. My substitute child is now up off the floor, in my face, blocking the computer screen and demanding my attention. P.S. This yellow-eyed liver-eating mutant named Eugene from episode 3 still scared me a little. Sweet Dreams. See you tomorrow. Kristy and Adam's Most Excellent Unexpected Japan Holiday - Part Three - I Still HEART Tokyo! And............We're Back in the Game! Happy Birthday To My Handsome Husband! Get Ready For Your World To Change! Strawberries, Chocolate and Pistachios...Oh My! So Kristy, what did you do on your days off? I'm a Lean Mean Sewing Machine! Girl with a Green Thumb. Ok. So I got distracted.